We had much better luck today in our search for Tim’s ancestors. Two very helpful librarians in Marion and Nelson Counties helped us locate cemetery records, newspaper articles and other documentation that aided our quest. Yesterday we had tried to locate the house built by Clement Hill, Thomas Hill’s youngest son. Sadly, we discovered today that the house had been demolished between 1960 and 1970. We viewed a microfilm copy of a newspaper article from 1960 that included a photograph and a description of the house. So at least there is a record of it. We also confirmed that Clement Hill and his wife were buried at St. Rose Cemetery, which we visited yesterday, but their headstones had disappeared underground over the years. No wonder we couldn’t find the headstones. It was reassuring to confirm that we had not overlooked them. Our search for Charles Hill was much more interesting and productive. During lunch in New Haven, a gentleman and his son at the next table complimented us on our RV. It seems that the RV had attracted a bit of attention in town. We had been in the area yesterday, and his son had noticed our RV. Of course, he saw it again today when we parked at the diner. I’m sure they were wondering what we were up to. We described our search and found out that their family name was Pottinger, as in Pottinger’s Creek where Charles Hill had settled. Talk about a small world. We knew that Charles Hill was buried at St. Catherine Cemetery in New Haven, but did not know where to look. We stopped in the branch library in town and learned that an inventory of all cemeteries in Nelson County was on file at the main library in Bardstown. What luck! After a quick detour to Bardstown, we were in possession of a map of the cemetery. On our return to New Haven, it didn’t take us long to find the headstone for Charles Hill. What is so odd, however, is that a new marker has been added in front of the original marker, which is illegible. Who may have added this marker is unknown. Tim is satisfied that we have accomplished what we set out to do. We found what could be found and confirmed that some things simply no longer exist. It really turned out to be a fun and satisfying search. Tim and I arrived in Kentucky yesterday and drove through mile after mile of beautiful countryside on our way to Versailles. Here we visited with Angela, Jane’s sister, and the last of the Caporelli clan that we would meet up with on this trip. I never would have guessed that we would have the opportunity to catch up with the entire family. Seeing Angela and her friends Liz and Lisa was so much fun, and we talked and laughed over drinks and dinner. Versailles is a historic town just west of Lexington, Kentucky, in the heart of Bluegrass country. This morning, Tim and I explored two-lane scenic byways lined with incredibly beautiful thoroughbred horse farms. There is no place like this anywhere, and I think it’s one of the most beautiful regions in the country. The horse farms are lined with picturesque, dry stone walls and mile after mile of black wooden fences. Huge barns set in manicured fields are visible in the distance. I could have wandered around Lexington all day, but we had things to do, namely, search for some of Tim’s ancestors. Thomas Hill was one of Tim’s ancestors on his mother’s side. Hill settled in central Kentucky in the eighteenth century, and he and many of his descendants are buried near Springfield. We couldn’t start our search on an empty stomach, so we had a great lunch in Springfield. The chicken and dumplings and the pie were simply divine! We visited St. Rose Catholic Church hoping to find family headstones in the church cemetery. Unfortunately, St. Rose never kept records of where individuals were buried, nor did the church ever map the graves. So, we just started wandering through the cemetery in search of the name “Hill.” We did find several members of the Hill family, although not necessarily the earlier generations. The older headstones throughout the cemetery were beautiful, but it was sad to see the condition of many of them. Too many are broken, and the names on others are illegible. We then went in search of the house built by Thomas Hill’s youngest son. Although Tim had a good description and what seemed to be good directions, we were unsuccessful in our search. A search for another cemetery at St. Ann’s Church was also a bust. It was pretty discouraging to come up short. Maybe we’ll have better luck tomorrow. We arrived in the Chattanooga, Tennessee, vicinity last night and set out this morning to visit Chickamauga and Chattanooga National Military Park. In 1863, Union and Confederate forces clashed here in some of the bloodiest fighting of the Civil War. The Union’s goal was to capture Chattanooga, a key rail center and the “Gateway to the Deep South.” Although the Confederate army was victorious at Chickamauga in September, Union forces were victorious in renewed fighting in Chattanooga two months later and seized control of Chattanooga. At the Chickamauga Battlefield visitor center, we learned that Chickamauga and Chattanooga was the first, and largest, national military park in the nation. It was also the model for most national military and historical parks to come. I had never given it much thought before, but I probably would have guessed that Gettysburg was the first park. The 1890 legislation that authorized four national military parks (the others were Shiloh, Gettysburg and Vicksburg) can also be considered the beginning of the Federal government’s role in the preservation of historic sites. The legislation set forth four goals – preservation, education, commemoration and access. This was also new to me, as I don’t recall this legislation ever being mentioned in any books I’ve studied on the history of historic preservation in the United States. It goes to show you that there’s always something new to learn. Commemoration is a major part of the experience at the park, and the driving tour took us by many of the countless monuments erected by state governments in honor of the military units that fought here. Between 1893 and 1910, more than 1,400 commemorative features had been installed here. It was interesting to see the variety of monuments on the battlefield and the ways in which the various states chose to commemorate their fallen troops. The native peoples of North America built earth mounds over a period of thousands of years, and these mounds can be seen today in a number of places throughout the Southeast and Midwest. Tim and I visited mounds in Florida earlier this month, and Jane and I stopped at the Hopewell mounds in Ohio during the first part of this trip. Today, Tim and I made our way to Macon, Georgia, and the mounds at Ocmulgee. Ocmulgee National Monument preserves a continuous record of human activity in the Southeast from ancient times to the present day. The Mississippian culture arrived here around 900 BCE (Before Current Era) and constructed a series of mounds near the river. These mounds were important places in the religion and politics of the Mississippians, and the mounds evolved to their full height over the years. Various types of mounds are found here, including temple mounds, funeral mounds and a cornfield mound. For me, the most fascinating aspect of the site was the earthlodge, a ceremonial meeting place for the town’s religious and political leaders. The earthlodge here is one of the oldest, largest and best-preserved Native American ceremonial lodges in North America. Although the existing structure is a reconstruction, the clay floor is original and is approximately a thousand years old. Being able to actually walk inside the lodge and gaze at a millennium of history was an incredible experience. Sadly, a large section of the site, including a portion of the funeral mound, was destroyed by a railroad cut in the 1870s. The railroad also split the site in two parts, separating the area around the earthlodge from the mounds along the river. The mounds were finally preserved in the 1930s, and the archeological excavation that followed was the largest of its scope in the country. The visitor center at Ocmulgee National Monument is a wonderful example of Art Moderne style architecture and houses a wonderful archeological museum. Incredible examples of pottery, effigies and other artifacts are on display. Of all the mounds we have visited, this was by far my favorite. We came here almost by accident, and I’m so glad that we decided to make this detour on our way north. It may appear that we are backtracking a bit, since we crossed into Georgia late yesterday afternoon. There is a method to our madness, as southwest Georgia seems to be an interesting point of departure for our eventual drive into Kentucky. From here, we can head north on one route and south on a different one. Southwest Georgia has two national park units, and we visited both of them today. Jimmy Carter National Historic Site and Andersonville National Historic Site could not be more different. Plains, Georgia, is a pretty little town, and has always been home to Jimmy Carter. The Jimmy Carter National Historic Site encompasses much of the town. Carter grew up just outside of town and continues to live in the home that he and Rosalynn built in 1960. Plains High School has been restored for use as the park’s visitor center and museum. Plains Depot, which served as Carter’s campaign headquarters, is also open to the public, as is his boyhood home and farm. Plains High School is a beautiful building and is perfect for housing exhibits that explore Carter’s life and contributions. The museum interprets Carter’s boyhood in Plains, his years in the Navy, his return to Plains in 1953, his entire political career and his work today with the Carter Center. I had forgotten much about his presidency, and it was good to be reminded just how much Carter did accomplish. I continue to be impressed with his work with Habitat for Humanity, his efforts to advance human rights and his mediation of peace agreements throughout the world. Tim and I wandered around Plains and had lunch downtown. The peanut theme is a bit overdone in Plains, but it seems to be effective, since we ended up leaving town with fried peanuts and peanut brittle. Naturally, we also had to sample homemade peanut ice cream. It was really delicious and so much better than I had expected. From Plains we made our way to Andersonville National Historic Site, the location of the most notorious Confederate prison camp during the Civil War. We arrived just in time for a ranger-guided tour of the site. The tour was immensely useful in helping us to understand the scope of Andersonville, since no structures exist today from that awful period. A few earthworks and the sites of several wells are the only physical remains from the camp. The intangible remains are another story. During the fourteen months that the prison existed, more than 45,000 Union soldiers were confined here. At least 13,000 died from disease, malnutrition, poor sanitation, overcrowding or exposure. Conditions were horrific. Visiting the site today and viewing the small reconstructed sections of the camp can give one only a vague sense of what it must have been like in 1864. Andersonville National Historic Site interprets much more than its Civil War past, however. It is a memorial to all prisoners of war and is the only National Park unit to serve this purpose. The American prisoner of war experience from the Revolutionary War through the Persian Gulf War is told here through exhibits, videos and oral histories. After a sobering history lesson, we did have fun talking with the rangers at Andersonville, two of whom previously worked at Big Bend National Park. We received great tips on visiting that park and filed the ideas away for future reference. We headed toward Macon, Georgia, and settled into Arrowhead Park at Lake Tobesofkee Recreation Area. This is a beautiful county-operated campground, and we have a site right on the lake. There is something to be said for waterfront property. It is so nice that we have decided to stay here for another day to take advantage of this wonderful location. The sun was shining this morning, and we were finally able to leave Montgomery. 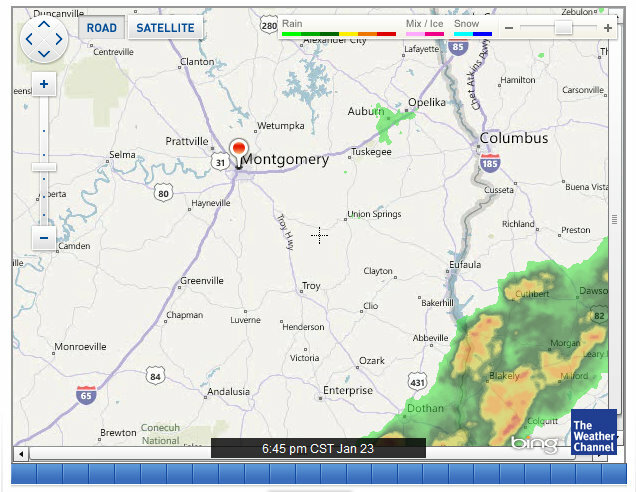 Our plan was to drive east toward Tuskegee, Alabama. The National Park Service administers two historic sites in Tuskegee: Tuskegee Institute National Historic Site and Tuskegee Airmen National Historic Site. We wanted to visit both. Tuskegee Institute National Historic Site is nestled within the historic campus of Tuskegee University and includes the George Washington Carver Museum and The Oaks, the home of Booker T. Washington who established Tuskegee Institute. Tim and I had learned about Washington when we visited his boyhood home in December. Tuskegee University is a beautiful campus, and many of the buildings constructed while Booker T. Washington was president are still standing. Many of these buildings were actually constructed by the students from bricks that they had produced. It was so pleasant to wander through the campus on such a beautiful day. Tim especially enjoyed talking with a volunteer at the museum, an elderly woman who moved to Tuskegee from New Jersey and raised her children there. We spent quite a bit of time at the museum where we expanded our knowledge of George Washington Carver. What an incredible man! Born a slave, Carver developed a passion for knowledge. Although most people associate Carver with developing new uses for peanuts, how many know that his first love was art? Several of his paintings and drawings are on exhibit at the museum. But Carver is best known as a scientist who reinvented agriculture in the South. He encouraged farmers to grow a variety of crops, instead of relying on cotton which was depleting the soil. In order to convince farmers that there was a market for alternative crops, such as peanuts and sweet potatoes, he researched dozens of ways to utilize these crops. Carver was the most celebrated professor at Tuskegee Institute and worked tirelessly to educate not only its students, but also farmers throughout the South. One facet of Carver’s work that particularly intrigued me was the weight he placed on beauty. Carver developed a rich array of inexpensive paint colors from local clays and demonstrated to impoverished farmers how pleasing color combinations could improve the looks of their homes. He also provided farmers with flower seeds to plant near their homes to add a touch of beauty. It was coincidental that we visited Tuskegee Airmen National Historic Site this week, just days after the release of Red Tails, George Lucas’ new movie about the Tuskegee Airmen. Everyone we spoke with was so excited about the movie, which had been years in the making. Tuskegee Airmen National Historic Site tells the story of the African American men who arrived at Moton Field in 1941 to begin their training as Army Air Corps pilots. The story of the Tuskegee Airmen is well-known, and it was really cool to walk through Hangar No. 1 where they learned to fly, hear about the obstacles the men had to overcome and listen to their voices through oral histories. The exhibits here are very engaging. The park has not yet been fully developed, and plans are underway to expand the exhibit space into Hangar No. 2. Plans are to bring a P-51 Mustang to the new space. The P-51s were given the nickname Red Tails because of their distinctive red tails. Now that would be something to see. A highlight of our visit was speaking with a ranger who was so excited to share the story of these men and to separate fact from fiction. Tim and I appreciate everyone’s concern about our well-being in lieu of the recent tornado activity in Alabama. Rest assured that we’re just fine. We had made the decision yesterday to stay put in Montgomery. The weather ended up being ok yesterday afternoon, and it seemed like we would be able to leave this morning. Overnight, however, tornados moved into Alabama from Arkansas, and two people were killed early this morning in the Birmingham area. There was a tornado watch for our area until noon today, as well as a severe thunderstorm warning. We looked at the area to our east, where we intended to go, and found that the storm was headed that way. A tornado watch was in effect there until 4:00 pm. There didn’t seem to be anywhere nearby without some kind of watch or warning. So, we made the decision once again to stay put. We may have been overly cautious, but we are in no hurry to get anywhere and wanted to play it safe. Besides, it would have been no fun to be on the road, worrying about what the weather might do. The weather turned nice this afternoon in Montgomery, and we took the opportunity to get out and purchase a few supplies, fill the propane tank, get the batteries checked out and make a run to the post office. We had a successful day and felt like we accomplished at least a few things. The forecast looks promising for tomorrow, so it looks like we’ll be able to hit the road once again. As we were leaving our lunch spot in Montgomery, Alabama, yesterday afternoon, the skies opened up and the largest raindrops I’ve seen in a while left us drenched. We made it back to the RV and began to seriously reconsider our next move. We had listened to the weather last night and knew that storms were predicted, but did not pay too much attention to them. I took a look at the weather forecast for Tuskegee, where we were heading, and saw that a tornado warning was in effect for the afternoon. That was enough for me. 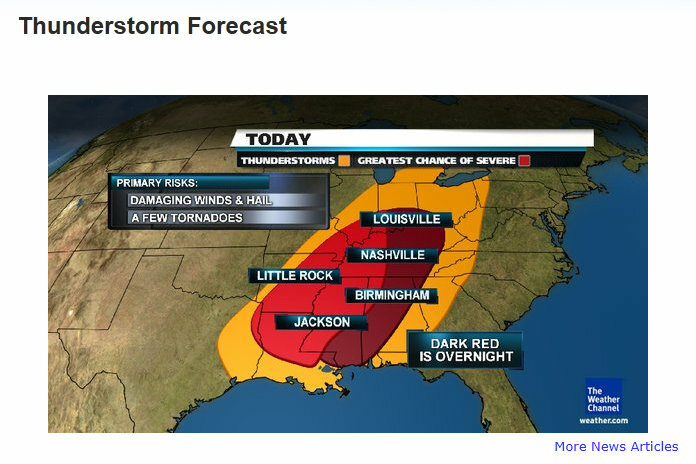 I’m never crazy about traveling in a storm, but I was not willing to tempt fate with the possibility of a tornado. We found a Drury Inn nearby and checked in. It was nice to be out of the weather. This is the second Drury Inn we’ve stayed in, and this chain is perfect for us. It’s a nice chain, is very clean and is very pet-friendly, with nary an extra charge for a pet. Happy hour and breakfast are included in the rate, so you don’t even have to leave the hotel if the weather is nasty. 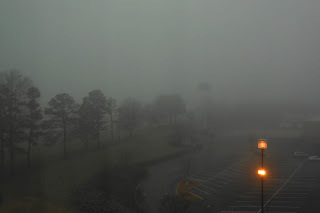 We had planned to leave Montgomery this morning, but the weather forecast was not much better than yesterday. 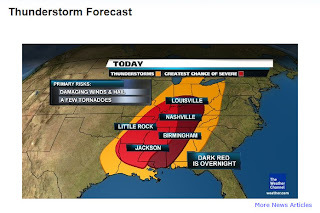 No tornados were predicted, but severe thunderstorms were still in the forecast. Plus, the fog was so dense this morning that we could barely see out our window. It was an easy decision to stay put for another day and wait out the weather. It’s so nice we have the flexibility to change our plans whenever we feel like it.